You’d think running a city would be a straightforward matter. How hard can it be? Tell the people what to do and they’d go off and do it without question. Sometime later the fruits of their labour would be there for you…er…everyone to enjoy. It seems that somewhere along the way, somebody introduced knowledge and free will into the mix which has thrown a nasty spanner into the works. And don’t get me started on happiness – you’re here to work, not have fun. What do you think this is? Disneyland? Get back to your jobs, plebeians. 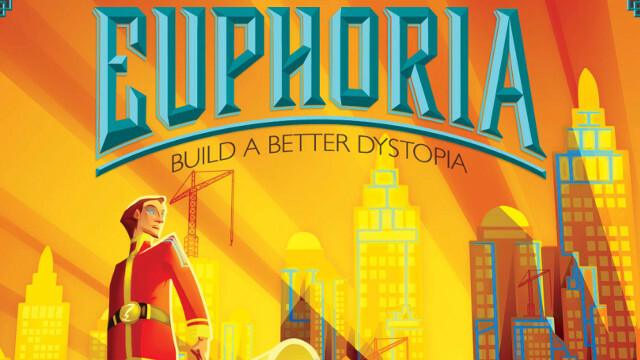 Controlling the masses under the oppressive heel of authority isn’t as easy as you may think – a notion captured rather well by Euphoria from Stonemaier Games. In this dystopian worker placement game, you play the role of a middle manager – a term I’ve been described as in the past which I took considerable objection to – who’s taken upon themselves to take control of the city of Euphoria. Doing so requires the players to influence the four areas of the board to their advantage whilst denying their opponents the same luxury, represented by stars. Place all 10 of your stars and you win the game. 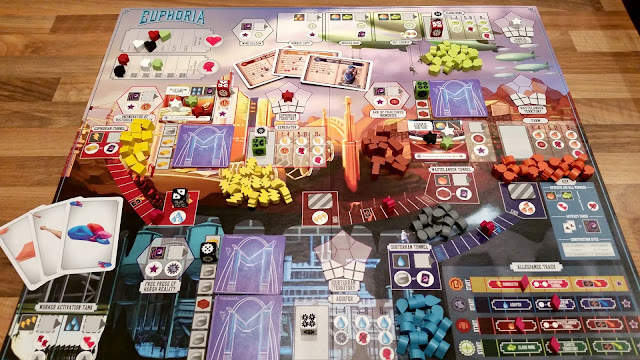 Speaking of board structure, it’s essentially broken up into four main areas: the city of Euphoria itself, the Wastelanders outside the city, the Subterrans beneath the city and Icarus – the flying markets. These areas represent the four factions within the game. The three ground based areas all work on a similar premise – they produce a single Commodity (Electricity, Water and Food) and a single Resource (Gold, Stone and Clay). Icarus only produces a Commodity, the gas Bliss. One of the unique ideas in Euphoria is the way the workers are represented. Instead of standard meeples, your workers are represented by dice – D6 to be precise. Each player starts with two from a pool of four. 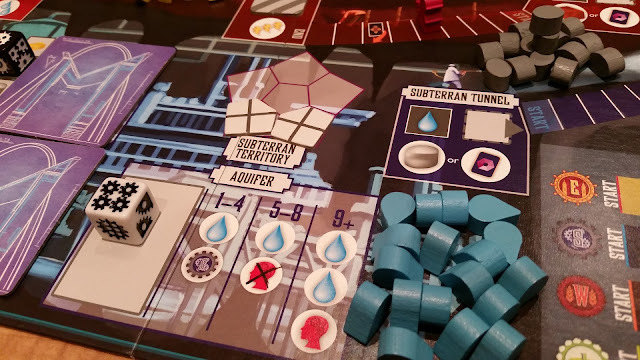 You can activate more during the game, entertainingly by either fire hose or electric shock – a notion I found particularly hilarious. But there’s a catch. Each worker is rolled before they’re placed – the die score representing their individual knowledge. For you see, for a Dystopia to function effectively the masses must be kept happy, but remain ignorant. If collectively your workers get too knowledgeable then the cleverest one will bail out. Each player receives champions from different factions (they’re semi-randomly assigned at the start) who can aid in your oppression – they grant special bonuses depending on actions. Players can activate more champions as they go and as they gain more influence in certain areas. 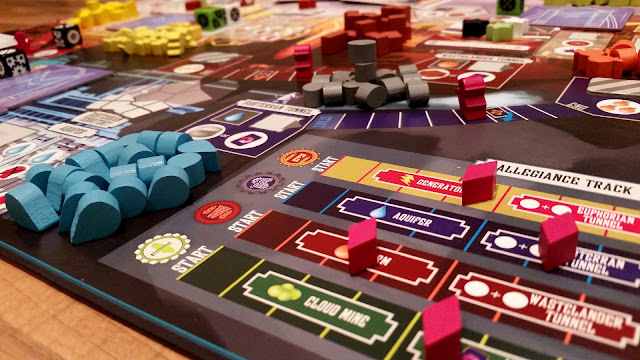 To win the game, you must trade Commodities for Resources which primarily allow you to build Markets – the focus of the ground-based areas. Each ground area has two markets that first require building. Players contribute Resources to the markets to build them, then they can influence them by meeting certain criteria. If you don’t contribute to the markets, then you suffer a penalty. These penalties range from slightly inconvenient to, frankly, bloody annoying; and thus we arrive at my small gripes with the game. There’s one penalty that I think is a little too powerful and quite a few that aren’t really powerful enough – so like a drunken tightrope walker, there’s a lack of balance. The box contains 18 market cards, but you’ll only use six in each game so some games may be more balanced than others. On top of that, there’s a limit to the number of contribution spots for each market – for three or more players, this isn’t an issue as there’s always one fewer spots than players so someone will always have a penalty (isn’t dictatorship fun?). For two players, no such encumbrance exists so the game turns into a race, which I feel is a small weakness in the game. It’s not a deal breaker, but the game becomes less tense and a couple of dodgy dice rolls means you’re going to suffer quite considerably. Despite all of this, there’s so many other elements to the game that work really well that I’m more than happy to forgive the market shortcomings. The way workers can be moved about (booted) in the tunnel areas and how all workers from all players contribute to knowledge in others are great mechanics. The tunnels themselves represent a devious way of each different faction trying to steal from another and used in the right way, can be very powerful. Working out exactly how is part of the fun. Despite the slight imbalances in the markets building and penalties, there’s plenty in Euphoria to recommend it. 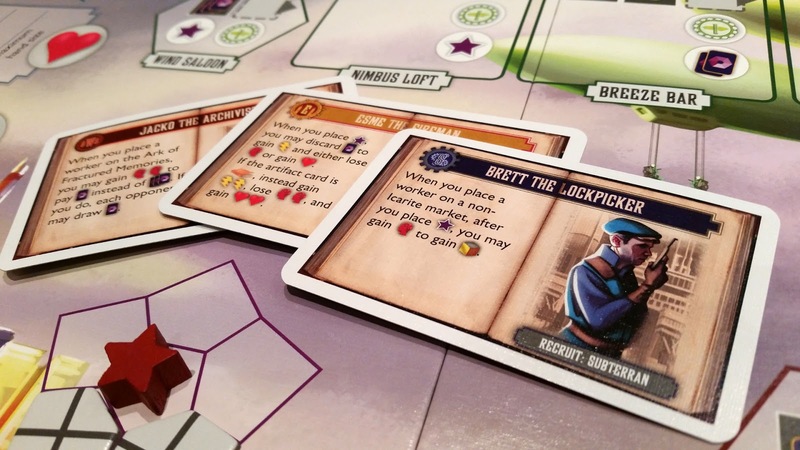 This game is in fact my entry drug into the Crystal Meth that is the world of Stonemaier Games and I’ve become a huge fan of their work – which may say more about me as a person, but the fact that I love their stuff speaks volumes about Euphoria’s quality and playability. So I like Euphoria a lot. And you will too.